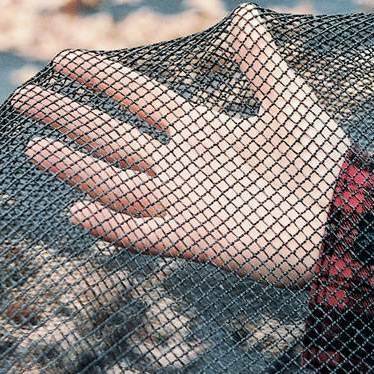 Winter Covers, Solar Blankets, Safety Covers, Leaf Nets and more. 2018 SALE IS ON! 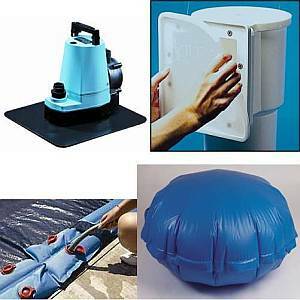 Retain heat in the pool, lowering expenses and extended the swimming season. Reduce the amount of chemicals required. Maintain cleaner water by keeping out leaves, dirt, and other debris. Prevent accidents and safely keep out unwanted visitors. 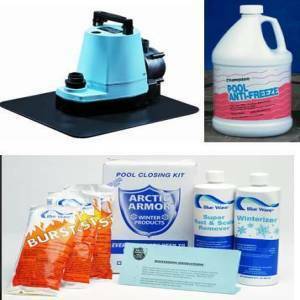 Protect the pool from harsh winter weather. 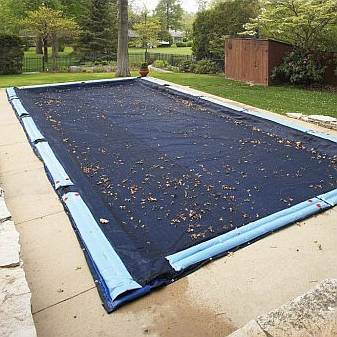 Find out about Closing your pool for the winter. <-- View reminder List of things to do. ...are the most popular due to their relatively low cost and low impact installation and are rugged covers that help keep your pool healthy over the long cold season. They are designed to prevent light and curtail algae blooms and prevent leaves, twigs and other debris from entering the pool water. They are much lighter and easier to put or take off on than safety covers, but do not prevent accidental pool entry from small animals, kids, etc. ...are ideal for lengthening the time to use your pool when there are warm sunny days and cool nights. It looks like bubble wrap floating on the water, trapping heat in the water, prevents evaporation and is super easy to put on or take off. Primarily used in the spring or fall. ...are the ultimate cover to close any pool. It offers all the benefits of a typical winter cover but are dsigned with Safety in mind. They are sturdy, thick, and lock over the pools with straps with springs to anchors. You will see many promotional images of cars, kids or even baby elephants on the cover, but their primary purpose is to try to keep small animals and humans out of the water for their safety. And there are countless stories that prove their worth quite well. Many home owner associations and local codes/laws require this type of cover too. ...are designed to be used on top of a standard winter cover. Use to pull off the leaves after the fall season, or just before taking off the winter cover in the spring. Many pool owners have used tent stakes with ropes or bungee cords to stretch the cover over the pool to keep out leaves and debris during the summertime. Well, it works for them!. 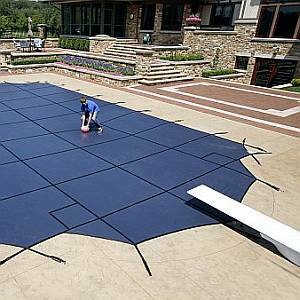 Whatever your cover need is for your pool, you can find more details by clicking below.